Winter is a time when British cooking comes into its own. With slow-braised meats, dried fruits and game, especially goose, in plentiful supply, this is a time for cosy family dinners. I have great memories of hearty winter meals and gratinated cobblers being shared at the family table on dark winter nights. Halloween has passed and the fireworks have cooled, these dates bear little relevance to food for me other than a mark in the calendar. But they signify that it’s time to begin the pot roasting of game birds, ordering of geese and writing of menus for Christmas and the New Year celebrations. I find this far easier once the British weather has found its default setting and there is a constant nip in the air. I look forward to goose season all year round—it really is one of my favourite birds to cook with. Every year, we celebrate the festive season by offering goose as our celebratory feasting main course. This year, Upstairs at Trinity will play host to our goose feasting menu. We will be doing these feathered fowl justice by serving them with cranberry stuffing, roast roots, buttered sprout tops, goose fat potatoes and rich cooking juices. These beautiful geese are raised on Blackwells Farm in Essex by George Blackwell (http://www.blackwellsfarmproduce.co.uk/). 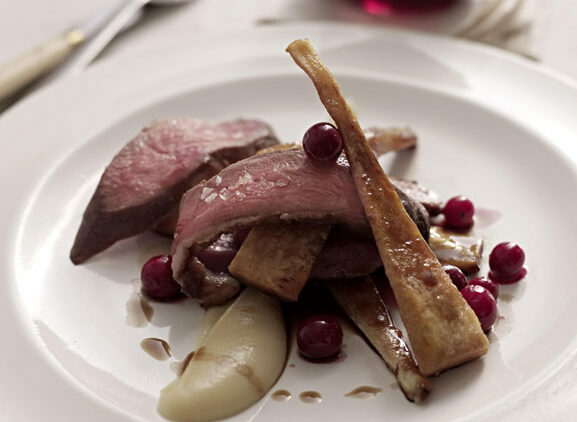 For a relaxed Christmas dinner in with the family, I recommend this stunningly simple recipe for ‘Breast of Goose with Cranberries and Celeriac’. This is a great dish to serve during December or early January when you want something sophisticated. The ingredients really complement each other, the cranberries balancing out the fat in the goose breast. You can use duck breast as an alternative if you like, but try it with goose if you can, as the richness of flavour is unique and delicious. For a dessert that really hits the spot, try this recipe for ‘Semi-dried Winter Fruits with Calvados Cream’. This recipe works beautifully in winter, when the relevant fruits are in season. Plums and pears dry very well, as do apples (especially Russet, Cox and Pippin). I also use a few alternatives, such as pineapple or apricots, at other times of the year. Figs can be used all year round, but avoid bananas and fruits with a high moisture content such as melons and berries.